Tandem skydiving is two people diving from the plane harnessed together with only one parachute, where one hangs below and is attached to the other. This tandem relationship describes the connection between the Red and Black Horsemen of the Apocalypse; because they are working together to free-fall into the Lake of Hell-Fire. 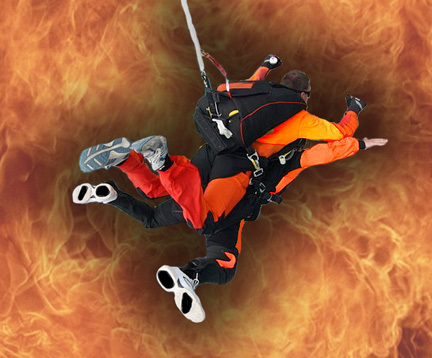 Both depend on good equipment, a reliable parachute, and an intelligent pilot; but the jump wouldn’t be possible without financing, training and participation of the jumpers. And while Satan and his synagogue financially supply what is needed to perform such a task, it is the decision of the individuals whether to jump or not. Because the world is currently controlled by this evil organization, there’s often a Satanic twist; in the fact that one jumper may not be a willing participant, but is coerced or forced. At first the free-fall may seem like smooth sailing, but there’s always the abrupt awaking that someone else is pulling the strings. It’s a situation in which the lead jumper cannot hang out in the skies forever, or be blind on where the two are headed. He can for a moment “choose to believe” these can be done – that flying high with closed eyes is possible; but the reality is he’s on his way down – he knows what’s coming – rock bottom. On a spiritual level, Lucifer knows what’s coming; but in his twisted version of reality, he thinks he can maneuver his own parachute to remain aloft as some heavenly body. Red is the color of Communist-Socialism, an invention of Satan himself – his version of a perfectly twisted totalitarian government. All he needed was a willing participant like Satanist Karl Marx to write down his dark ideas, so that they could be released on the world; and boy have they been! We are way past the point of his financing and finding lead jumpers, or individuals to train them, because many actually believe in his perverted rationale. Black is actually his underlying color, but they go hand-in-hand. That’s always been the case – one follows the other time and time again. Marx wasn’t the first to unleash a grand scheme on the world – we’ve had Grand Sanhedrins and others do the same, and their true colors come out again and again, from red cardinals to red armies, from black Jesuits to black operatives. How do Satan’s generals, colonels, sergeants, and soldiers earn their stripes? By being both red and black, or by being Marxist traders, pun intended, because trading and deceit go hand-in hand. Today’s market trading involves getting something for almost nothing. It’s unfair, plain and simple. They use an unfair judicial system, set up by inside traders; and are trying to avoid any heat from hot and shady deals going on under all kinds of cloaks, or disguises, in what would appear to be one big Halloween party, where they are just creatures of the night. 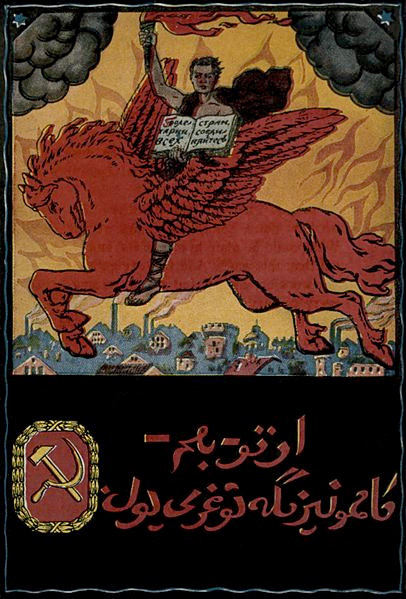 Prophecy through Posters: “Proletarians of all countries get up and unite”, 1921. 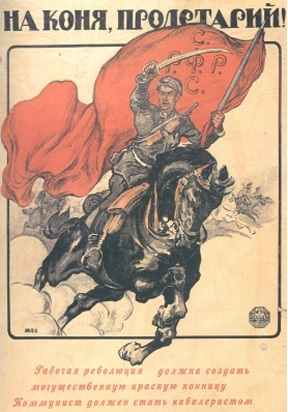 “And there went out another horse [that was] red (communism): and [power] was given to him that sat thereon to take peace from the earth, and that they should kill one another: and there was given unto him a great sword. And when he had opened the third seal, I heard the third beast say, come and see. And I beheld, and lo a black horse; and he that sat on him had a pair of (unjust) balances in his hand… (Rev. 6:4-5).” Satan’s great sword was given to take peace from the earth. It was Karl Marx, channeling for Lucifer, who said he would drag God down from heaven and defeat Him, with a great sword that Satan sold him, paid for with his soul. He was given power to take peace from the earth; but he will never drag God down, nor defeat Him. A deviant spirit showing his true colors around the world, whilst using patriot icons. After the rise of Satan’s Red Government under Trotsky and Lenin, Hitler took over the reins. Hitler dragged the world down the trail of destruction, so much so that Germany is still trying to rebuild from the damage. He was the anti-Christ in Revelation 13. Some people keep waiting for “the Anti-Christ” to show up; but his spirit never left; because anyone against Christ is technically anti-Christ. Hitler thought he’d bring in the next millennium with his “Thousand Year Reich/Reign”, and even wanted to replace the Bible with “Mein Kampf”. Just last year, North Korean communist leader Kim Jong Un gave Hitler’s book to his top officials to study. The following verses describe how Hitler rose to power and spewed lies. He “revived” the Roman Empire; and gave power to Marxism, which is still alive and well today, as those with Marxist-ideology rule over the rest of us by the power of their wealth, using his techniques. 13:11 And I beheld another beast coming up out of the earth; and it had two horns like a lamb, and he (Hitler) spoke as the dragon. The Holy Books have been clear about a Coming Judgment Day – all of them refer to it, over and over. To some, it is so dreaded that they scour to find the smallest clues to actually “avoid” it; as if that’s possible. No man knows the exact day, just as it is written; “But of that day and [that] hour knoweth no man, no, not the angels which are in heaven, neither the Son, only the Father (Mark 13:32)”; however, we’re given Signs as Clear Warnings; AND Revelation reveals it will be after the final War. Given man’s destructive technologies and behavior, a Third World War will be the last one: and according to Scripture, it’s going to kill ONE-THIRD of mankind. Satan and his crew like these numbers; because while their eyes see Red, their souls are black. And to a spiritual person who sees beyond the physical, he is able to see the soul through the mirrors of it – the eyes. A person attuned with God can develop this observation skill by studying those who are controlled by Satan; and observing their eyes, and even their facial expressions, like sickly smirks. You can bet that the one smirking is the little devil inside them. And on a day-to-day level in our personal lives, a person attuned with God learns to disarm these little devils in a constructive way – we are trying to win the souls for God and help them release Satan’s control of them, remember? But for many out there, no matter what we do or say, they will never budge. They get kicks jumping out of planes, and like the “joyride” down. Prophecies are to be fulfilled, and they are based on our actions. Too many of us are in denial. We are bringing this on ourselves for charioting behind the Red and Black Horsemen, which aren’t really jumping out of planes, but stampeding for a cliff with no parachute. For people who hear the war-drums and know the players, they speculate on when the final phase of the Never-Ending War of Terror leading to WW3, will commence. “And the four angels were loosed, which were prepared for The Hour, and The Day, (the month, and the year) for to slay the third part of men (Rev. 9:15)”. Who’s not seeing the signs that the coming deadly war is part the New World Order’s end-game? No matter what distractions are going on in the world, the four angels are located in the Middle East – that is where it begins, which is really where it ENDS, because it is the last phase; and, of course, Russia will be involved. 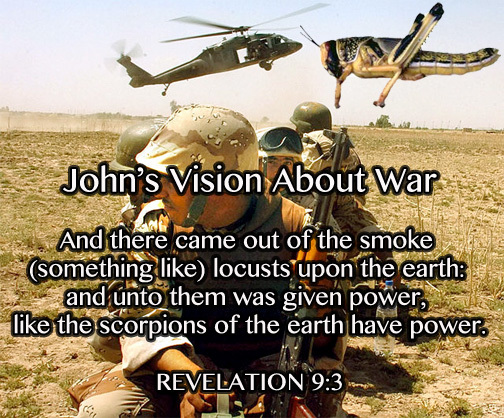 Revelation, Chapter Nine is about the wars in the Middle East, starting with Kuwait; and ending with this final war. Interestingly, Revelation 9:11 identifies Satan as the king over the ones who started all this destruction; thus it would make sense that the players and planners are in his synagogue (Rev. 2:9); and getting paid handsomely with worldly possessions and power. This is a simple deduction of all that’s adding up. Things aren’t equal. There is no “six of one and half-a-dozen of the other”. On a pair of unjust balances, a basket containing one ounce is weighing more than the basket containing 99. This is because Marxism (Red) ushered in all this Zionism (Black) unfairness; even to the point that one country’s gold and resources is another country’s treasure, albeit stolen. Horn is a Biblical code-word for kingdom, thus four kingdoms are being referenced. The kingdoms are now referred to as angels. There are reasons for this code-word switch. One concerns hiding the prophecies so that Satan’s synagogue couldn’t “disappear” them; and another reason is so that they could be correctly interpreted when the Sign needed to be understood. Angels bring in “the time periods” and are signs to keep watch for. The Middle East, made up of descendants of the 12 Tribes of Ishmael, used to be God-fearing nations and true in faith; but Satan got control of its leaders and power-players too. He’s covered his bases well; and Saudi Arabia is a prime specimen. The faithful in the Middle East may not understand why their countries are being abased, just like the citizens in the West cannot figure out how the Bolsheviks got control of their nations. It might also interest you to know that the Russian word “soviet” means “committee”. But they ignore the fact that the Bolshevik Revolution was planned by Russian counterfeit-Jews living in the United States and funded by those living in Europe, as per Myron C. Fagan’s writings on the Illuminati and Zionist’s Protocols (sourced below). On a spiritual level, Muslims went out of bounds – they strayed away from the Koran. They created and started studying the Hadiths, which are man’s interpretations of the Koran; and we know how Satan likes to use man for division. The Islamic tribes have believed in lies for a long time and divided into sects based man’s (little imams) interpretations of the Koran. They don’t need an imam-expert to understand the Koran in their stead. God doesn’t work like that. He works through people’s own minds and hearts – and He makes the message simple. Everyone will remain ignorant about what is in the Holy Books, if they don’t spend time with them, and with God – and God works on whatever level the reader is at to learn. He will teach them what He wants them to know, if they are sincere. All these fake jihads are not of God. His Holy Jihad concerns the Seventh Trumpet; that He ALONE decides. Muslims are not His partners in these matters. And without stretching the imagination, these fake jihads are probably black operatives, fake-Muslims, who get on fake-commercial airliners and take down real buildings; or incite hatred among people. To be fair, fake-Christians and counterfeit-Jews do the same, because Luciferians wear all kinds of hoods, fashioned by brothers. These “fake outs” have worked brilliantly to cause conflict for centuries. It certainly doesn’t help that Muslims go along with this insanity. 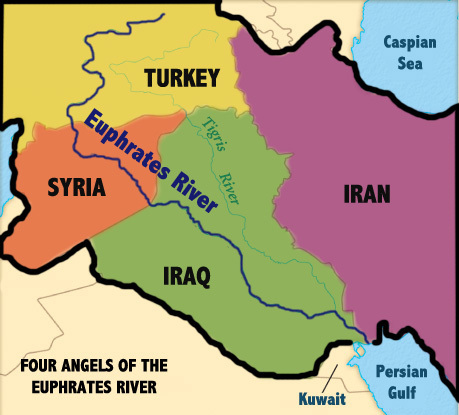 Iraq, Syria, Iran and Turkey are the four kingdoms, angels, bound in the River Euphrates. They are the four countries located on the banks of the Euphrates. The Euphrates River begins in Turkey, flows through Syria and Iraq, joins the Tigris, and then becomes the Shat al-Arab waterway, that is the border between Iraq and Iran, over which they dispute, and empties into the Persian Gulf. The prophecy states that they will be loosened. While “loosened” can have different meanings when it comes to interpretation, perhaps the more appropriate one is that they become UNBOUND. And with this war of terror, this unraveling is happening one by one. They are no longer bound by Islam, which means doing God’s Will. There are too many secrets at play about which country, or more specifically its leaders, are aligned with traders; because this undoing started from within first. Revelation also gives us insight that the Fifth Trumpet sounded in the Middle East (Rev. 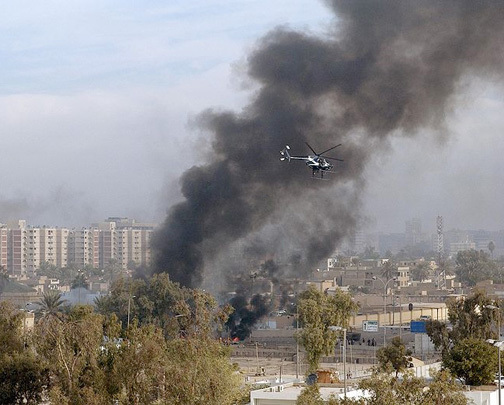 9:1), described in the “The Invasion of Kuwait in Prophecy” by JAH. Over mankind’s history, many faithful Muslims have been slaughtered by war, conflict and oppression. But just like with any tribe, Satan gets his hands on a few who turn against the rest; and, of course, the sneaky fake devils play their parts, infiltrating and annihilating. But because there is a big, nasty war in the Middle East, they are crying today, loud and clear, “How Long, Oh Lord?” Think about an Arab child in the Middle East who was 10-years-old when “Operation Iraqi Destroy” began. He is a young adult now and all he has ever known is war. All he understands is that the West destroys – one country after another, in a grand scheme to rule the world. How long until the Middle East is undone? The Signs are certainly indicating it’s fast approaching – their powers (kingdoms) are certainly being drained; “And the sixth angel poured out his vial upon the great River Euphrates; and the “water” thereof was dried up, that the way of the kings of the East (eastern block) might be prepared (Rev. 16:12).” Again, the Euphrates is a symbol of power, just as water is a symbol for power; and when it is gone, dried up, no power remains. While the fifth angel dealt with the Middle East being punished (and essentially abased), the sixth deals with the West being punished AND ABASED, because after the Middle East turns to dust, next up is the West. The way of the kings of the East is prepared, and this means they will bring their armies, which happen to be 200 million, and will descend upon Israel. And if you think the Bible is just talking about an 8,000-square mile area in the Middle East, you have tunnel vision, and can’t see who the Israelites really are, because you actually think they are Israelis. 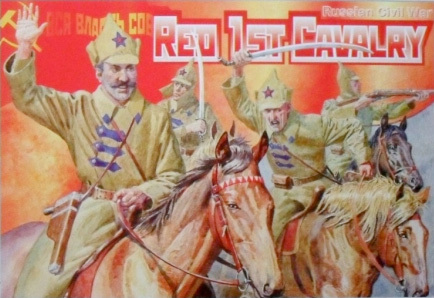 A lot of Western troops are going to die in battle, but this is karma, because these troops, who were supposed to be protecting their own, have and are protecting the Black Horsemen, who protects the one Marxed in Red, with all its black-company names. They operate as a band of brothers, who are really drug dealers, gun-runners, resource-thieves, murderers, and mind-control freaks, as revealed by Cathy O’Brien (sourced below). This good-ole boy system of hiding behind the bush in the Western scheme of things has to be brought down; and these troops will be neutralized. God will cause this to happen: He will grant Justice. The beginning of Revelation Chapter Nine describes what happened in Kuwait, such as people being burned with sulfur-brimstone from the smoke from sulfur-rich oil that they breathed in for months. The end of the chapter describes the last war, which again describes war-machines and smoke and fire. This time it’s going to affect the entire globe, because this war is going to kill ONE-THIRD of mankind. The entire world has been double-crossed. John was pretty accurate in describing what he saw. The Sixth Trumpet is upon us; and this brings about so much death and destruction to the entire world. 9:15 And the four angels were loosed, which were prepared for The Hour, and The Day, (the month, and the year) for to slay the third part of men. 9:17 And thus I saw the horses in the vision, and them that sat on them, having breastplates of fire, and of jacinth, and brimstone: and the heads of the horses [were] as the heads of lions; and out of their mouths issued fire and smoke and brimstone (sulphur). 9:18 By these three was the third part of men killed, by the fire, and by the smoke, and by the brimstone (sulphur), which issued out of their mouths. An army of horsemen that numbered 200 million (200 thousand, thousand). Who has that kind of army? The Red One. The Red Horsemen ride again. And they are not going to be nice, just as described by Chip Tatum in the his 1998 interview with Ted Gunderson (sourced below). He was an ex-CIA black-operative who warned America. He disappeared, or vanished, about a month after the interview. He just might have become too arrogant, but maybe he accomplished what he needed with his warning. He is a far cry from being a hero for the American people. He was one of those who took care of himself and his family; opting not to protect Americans from the evil within their midst, or the wickedness in their high places. He spent decades as a black-operative, doing things that helped get us where we are today – on this Satanic route, riding in a bandwagon pulled behind a Black Horseman. The powers FUELING the Black Horseman have lied, and they are more Red than they appear: “For their power is in their mouth, and in their tails: for their tails [were] like unto serpents, and had heads, and with them they do hurt (Rev. 9:19).” Their power comes from lying through their teeth, as they spew out venom from their mouths – telling one TALE after another, in all their false-flag attacks. All these wars didn’t start with this one in the Middle East. 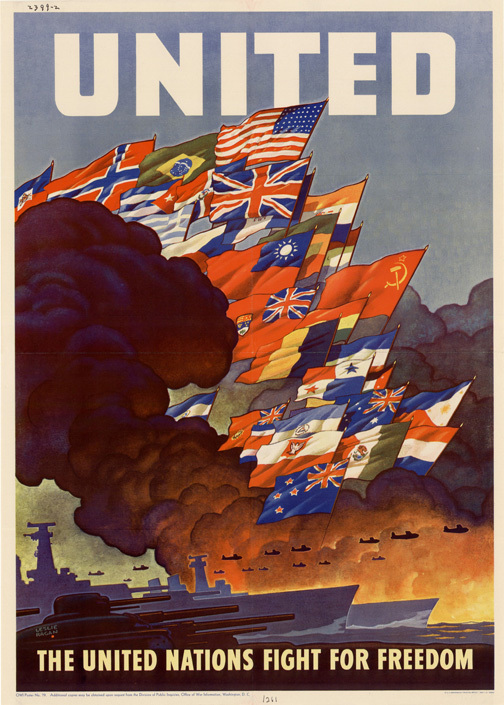 According to their Protocols, three world wars were planned. Biblically, it started in 1917, with the Bolshevik Revolution in Russia (Red October), which gave birth to the communist system. This is the beast system mentioned in Revelation: “And when they shall have finished their Testimony, the beast that ascendeth out of the Bottomless Pit shall make war against them, and shall overcome them, and KILL them (Rev. 11:7).” Communism overcomes them; it overcomes God’s Two Witnesses, Israel, descendants of Joseph’s two sons, “The Angel which redeemed me from all evil, bless the lads; and let my name [Israel] be named on them (let Ephraim [the U.K.] and Manasseh [the U.S.A.] be called Israel), and the name of my fathers Abraham and Isaac; and let them grow into a multitude in the midst of the earth (Gen. 48:16).” The Bible also prophesied that this rise would occur the same day (code-word for year), when Jerusalem was released from being trodden down, which happened in 1917, when the British [true Israel) forces liberated it from the Turks. Red Communism essentially showed it’s true color of Black in 1948, when Zionism set up shop in Jerusalem, “And from the time [that] the daily [sacrifice] shall be taken away, and the abomination that maketh desolate set up, [there shall be] a thousand two hundred and ninety days (Dan. 12:11),” or 1948. The beast-system arose from the Bottomless Pit in 1917, the 1260th day of Daniel 12:7 – a time, times and a dividing of time = 1260. Can hindsight give us 20/20? A little “ISIS-HORUS-SEB” icon. Enoch 58:1 – Prince Michael the Archangel condemned and then decreed that The Judgement shall fall on CHURCH and STATE. People can speculate the Hour or Day (THE TIME) when the Sixth Trumpet begins. It is the Second Woe (warning) that Christ told us about in Rev. 8:13. Many will still ignore the warning; just believing all the lies about why the West is annihilating the Middle East for Satan and his gang. They are annihilating a people who would have been their allies, but Satan has and continues to make them believe a tale about Islam, that it is full of extremists; never mind that these extremists are hooded personnel on a sinister mission; and getting rewarded handsomely for their dirty deeds. 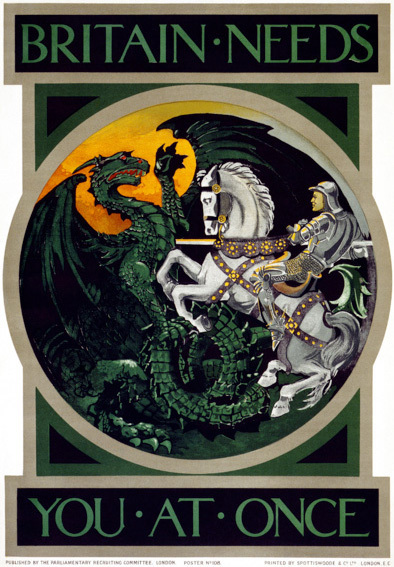 Of course, it’s probably not hard to recruit boys who are now young men, to help fight the evil Black West (in their black-busyness suits) and their Red Dragon (guarding London). Muslims have a name for it, called the Dajjal, and yes, it really has one-eye, but we call it the Eye of Horus, because all this evil is fueled by a Satanic-Luciferian construct with Egyptian-Babylonian Ideology to enslave the entire world. Yes, enslaved in Egypt again! Do you actually think a true Islamic State would call itself ISIS, after an Egyptian-pagan goddess/idol? Muslims are very strict when it comes Idolatry, unlike the West, which has allowed itself to become ethically and morally corrupt and idolatrous, which was again one of the black “protocols”. Who would really come up with that kind of “in-your-face” tactical name – ISIS – Israeli Secret Intelligence Service? Probably someone smirking behind the scenes, with one-eye, and who can’t see straight because he has tunnel vision. 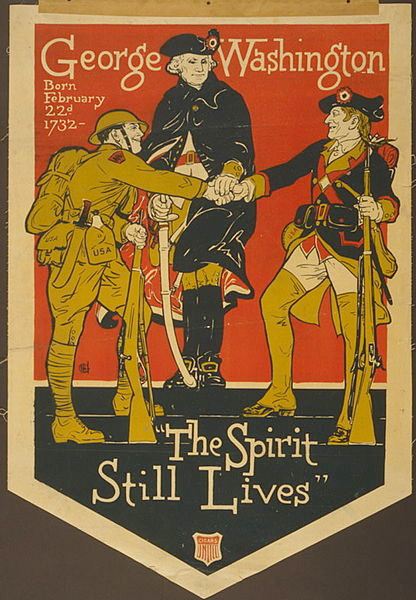 A “Committee” Supported Poster, 1918. And in that vision, Satan saw that young Arab boys would become young men today wanting Justice against their oppressors. And many are going to side with the Red Army to bring it. Satan also inspired another division, when China’s leaders set up its one-child policy, which has formed into a massive army of red soldiers. When the Russians combine with the Chinese, and bring along all their allies, including Arabs crying for Justice – there will be hell to pay – payback-time. God has allowed all this to build up, because He knew the secret plans/protocols of the Synagogue of Satan and its NWO scheme. “… Satan shall be loosed out of his prison, and shall go out to deceive the nations which are in the four quarters of the earth, Gog and Magog, to gather them together to battle: the number of whom [is] as the sand of the sea (Rev. 20:7-8).” Satan is using both color guards. It’s hard to decipher how they all fit together; and even some of them don’t know. Will Western troops sent to the Middle East need to know they will be killed? 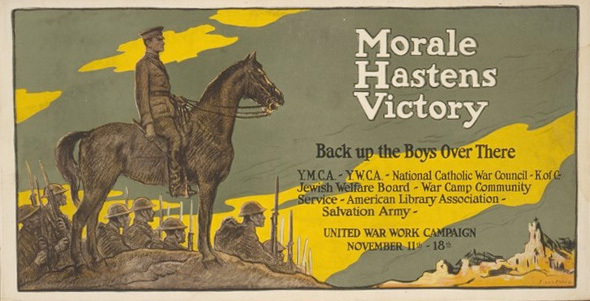 Not according to Satan’s Synagogue that works diligently to get the Red Army to react with War. It’s more theatre “to justify” actions. This equation began in Russia in 1917. If one has the answer to a mathematical problem, does he need to know all the variables? Depends on if he likes algebra or not; but Satan’s architects prefer geometry. Thank God, they can’t control all the variables, like the White Horseman – which is first and last on the scene. 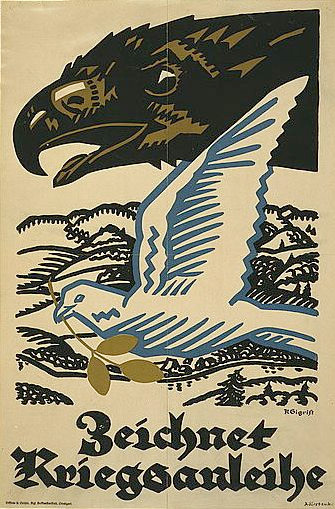 Prophecy through Posters. The White Horsemen showed up: Angel of Mons and Battle of Bethune. This article deals with the Red and Black Horsemen. But just briefly, the White One represents Christ. Holy Signs always come first and last, because they pertain to God, “I am Alpha and Omega, the beginning and the ending, saith the Lord, which is, and which was, and which is to come, the Almighty (Rev. 1:8).” The Pale Horseman is pestilence (disease), pollution, sickness and death; and we know it is running amok in the world. In Greek text, the pale color is sickly green; and interestingly look at what color they have assigned to this Ebola plague. Not that it’s the only sickness that we may or may not be faced with; because they are all pretty grim, slimy and expensive. It’s probably safe to assume that lies surround these concocted plagues. The Middle East is like the peacock or ostrich described in Job; “Which leaveth her eggs in the earth, and warmeth them in dust, and forgetteth that the foot may crush them, or that the wild beast may break them. She is hardened against her young ones, as though [they were] not hers: her labour is in vain without fear; because God hath deprived her of wisdom, neither hath He imparted to her understanding. What time she lifteth up herself on high, she scorneth the horse and his rider (Job 39:14-18).” The foot that crushed the Middle East actually belonged first to their own people, because these leaders had a heavy (iron-like foot) that bound and crushed them with burden and destruction. For instance, look at how the Shah of Iran on his peacock-throne and Saddam Hussein treated their own people; look at how black Saudi Arabia is; and look at NATO allies like Turkey. Whose side are they really on? In fact, all countries need to take a close look at their leaders and how their nations are being treated, from the top-down; and know who is in the midst of them; and who are leading the charges. If we elect our leaders to represent us, then aren’t we all nations of murdering, drug-pushers and gun-runners, who don’t mind amassing the wealth and resources of the world for our own personal pleasure and comforts? 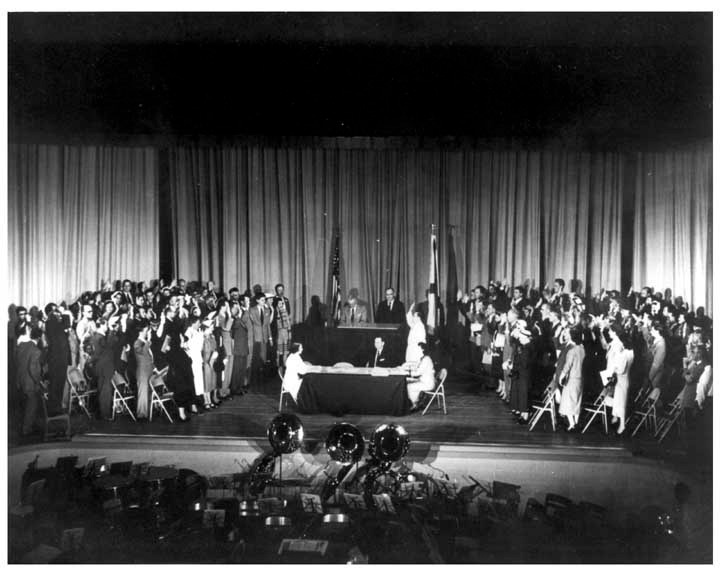 Thirty-nine of the German-born scientists at the U.S. Redstone Arsenal, along with the wives of two of the Operation Paperclip group, were sworn in as U.S. citizens at the 1954 naturalization ceremony. [They were formerly employed by Nazi Germany]. Who wears black? Take a close look at who’s “faking” the world out. Zionists, counterfeit Jews, who set up the counterfeit State of Israel. Over the world’s history, these Edomites have come and gone in the Holy Land. After they crucified Jesus, the majority was killed in Jerusalem’s second destruction. According to JAH’s research, some escaped and mingled with the Khazars; and many moons later, formulated the Bolshevik Revolution. Interestingly, God changed Esau’s name to Edom, because it means Red Soup (Gen. 25:30). These Zionists, who call themselves Israelis, actually hold dual citizenship in their State and with the West. They’ve set up shop all around the world. And while they make up only a minute percentage of the world’s population, they are the decision-makers in all political and corporate arenas, seeing as how they OWN and manipulate them. These are Ashkenazi (Nazi) counterfeit-Jews, and come from Noah’s descendant Japheth, not Shem: “The sons of Japheth; Gomer, and Magog, and Madai, and Javan, and Tubal, and Meshech, and Tiras. And the sons of Gomer; ASHKENAZ, and Riphath, and Togarmah (Gen. 10:2-3).” They are NOT Semites, but descendants of Japheth, not reptilians, aliens or giants; however, with a little MK-Ultra mind-control and media, they can get men to believe in a few tales. The schemes of these Nazis permeate the West; they are just hiding behind a bush; and most of their work is paper-clipped in a central operation, whose need for national security is paramount. From cover to cover, the Bible is full of prophecy; and if one isn’t reading it, he is behind the times. Another example is found in Ecclesiastes: “Or ever the silver cord be loosed, or the golden bowl be broken, or the pitcher be broken at the fountain, or the wheel broken at the cistern (Ecc. 12:6).” It is pretty much accepted that the silver kingdom in Daniel 2:32-33 is Medo-Persia; and in our world history, this powerful kingdom followed the Babylonian (gold); then came the Greek Empire (brass); followed by the Roman Empire (iron), which divided into Western and Eastern Empires – the two legs of iron. In Daniel’s description, when he gets down to the feet (the iron mingled with clay), we have reached the last of the Empires, before the Diamond comes Who is able to grind all others to dust. Daniel continues to tell us that a Stone will bring all these kingdoms down, and they will be powder in the wind. These empires have turned on the wheel of time, and have developed into what we have today with the Eastern and Western Empires – The East and West (and they’re more Roman and Babylonian than people realize, and more mingled than people know). Russia and the bands with them are told to get prepared, this includes Iran (Persia), Ethiopia, and Libya among many others. “Be thou prepared, and prepare for thyself, thou, and all thy company that are assembled unto thee, and be thou a guard unto them (Ezek. 38:7).” Russia will help guard all these countries that are being plundered in all kinds of ways by the West. The next verse says they will come against the mountains of Israel (Western governments). Yes, they are preparing – God is causing this to happen; and will ensure the West loses. And the kings of the East come from the north parts. Russia lies north of Syria, which lies north of the Holy Land. “Thou shalt ascend and come like a storm, thou shalt be like a cloud to cover the land, thou, and all thy bands, and many people with thee (Ezek. 38:9)… And thou shalt come from thy place out of the north parts, thou, and many people with thee, all of them riding upon horses, a great company, and a mighty army: And thou shalt come up against My people of Israel, as a cloud to cover the land; it shall be in the latter days, and I will bring thee against My land, that the heathen may know Me, when I shall be sanctified in thee, O Gog, before their eyes (Ezek 38:15-16).” Interestingly, there is a vision, attributed to President George Washington, of a black cloud of doom containing a dark-red light that covers America. Did he see the fall of his country, when God lets the enemy punish them? Ezekiel 13:10 – Because, even because they have seduced My people, saying Peace; and [there was] NO peace; and one built up a wall (UN), and, lo, others daubed it with untempered [mortar]. The defeat is allowed, but the Lord’s enemies still plot and plan, because they still conspire against God Himself. Remember, Marxism wants to kill God. Red and Black are mingled within Satan’s Synagogue – Tandem Buddies – didn’t Henry Kissinger say they would like a seamless union between Russia and America? 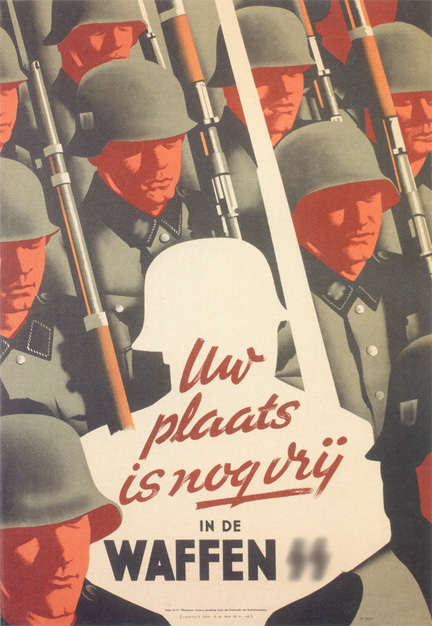 Do you not think the black generals know the Red Army wins? “And thou shalt say, I will go up to the land of unwalled villages; I will go to them that are at rest, that dwell safely, all of them dwelling without walls, and having neither bars nor gates (no defences) (Ezek. 38:11).” It’s all been planned, as the world is their stage, so they think. Because the different facets are on a need-to-know basis, and there’s a lot of double-crossing at play, they actually cause their own demise. Our guidebook, the Bible, gives record of this over and over. Look at what happened to Haman in the Book of Esther. This chief chamberlain was hung on the special gallows he built to hang Mordecai on. Truly, we have enough Signs and Warnings, but our vision is impaired and sense of spiritual-reasoning lost. We go along with all kinds of schemes, because we can’t stand firm in our God-given foundation, relying on the Cornerstone. Why the punishment? To bring us to our knees, in reverence, and in correct posture – head bowed. “So will I make My Holy name known in the midst of My people Israel; and I will not [let them] pollute My Holy name any more: and the heathen shall know that I [am] the “I AM”, the Holy One in Israel (Ezek. 39:7).” For Britain, America and the others, He will not step in for the final battle until the punishment has been fulfilled.” This is in part, because they have rejected Him and gotten in bed with Satan.